↑ 1.0 1.1 Southwell, C. (2008). Lobodon carcinophaga. In: IUCN 2008. IUCN Red List of Threatened Species. Downloaded on 28 January 2009. ↑ 2.0 2.1 2.2 2.3 2.4 Adam, P.J. (2005). "Lobodon carcinophaga". Mammalian Species. 772: 1–14. doi:10.1644/1545-1410(2005)772[0001:lc]2.0.co;2. ↑ Mori, M. & Butterworth, D. (2006). A first step towards modelling the krill-predator dynamics of the Antarctic ecosystem. 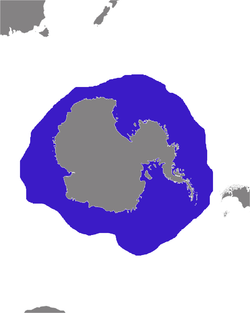 CCAMLR Science 13, 217-277. ↑ Siniff, D.B. and Bengston, J.L. (1977).《食蟹海豹，豹斑海豹及殺人鯨三者關係嘅觀察與假設》一文（Observations and hypotheses concerning the interactions about crabeater seals, leopard seals and killer whales），《哺乳動物學報》（Journal of Mammalogy）. 58,414-416. ↑ Siniff, D. B. (1991). 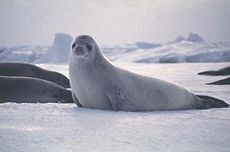 An overview of the ecology of Antarctic seals. American Zoologist 31:143–149. ↑ Smith, T. G., D. B. Siniff, R. Reichle and S. Stone. (1981). Coordinated behavior of killer whales (Orcinus orca) hunting a crabeater seal, Lobodon carcinophagus. Canadian Journal of Zoology 59:1185–1189.